Have you ever dreamed of relaxing in the backyard during a nice and warm weekend? With a drink in your hand and nothing to do with your day, it’d be nice to have a patio to keep the sun from your eyes. Today, we are going to be talking quite a bit about how you can improve the quality of not only your home but of your life, with the addition of a skllion patio to your yard. We’ll lay out all of the benefits before diving deep into the impact that the patio can have on the actual value of your home. First and foremost, let’s spend some time talking about what a skillion style roof actually is. When we talk about skillion patios, we are actually talking about the design of the roof. A skillion roof is a special type of roof that is sloped. These roofs are very common in modern designed homes and you’ll even see them in art house installations, as well. Skillion roofs are ideal because they offer a striking design that is as appealing to look at as it is functional. Skillion roofing can help to keep debris and water from building up, thus providing you with a healthy roof for a long time. 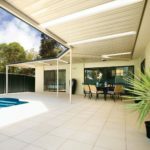 With all of that being said, now we get to talk a little bit about the benefits that an outdoor patio with a skillion roof can provide to your property! 1) Aesthetic Entertainment Piece – If you are looking to add a skillion style patio to your home then the odds are good one of your reasons is for entertainment purposes. Well, if you want an entertaining accent piece, a patio can do the trick for you. These eye-catching roofs make for the perfect place to set up a grill and some patio furniture. Enjoy a nice warm day with pleasant company, good food, and a cold drink. The hardest part of the experience will be forcing yourself to go back inside! 2) Embrace The Outdoors – As we’ve noted several times already, the sloping design of the skillion roof makes for a natural way to embrace the outdoors. The sloping roof gives you an unobstructed eye line toward the night sky and the rest of the world around you. If you want to lean back and enjoy the view, a patio with a skillion roof can help to make that happen for you. Not only are they pleasant to look at and easy to install, but they let you feel like you are indoors while also sitting outdoors. You’ll have plenty of ventilation, as well. 3) Durable & Longlasting – Finally, a skillion style patio can be a durable and longlasting addition to your home. Thanks to their minimalist design, a skillion roof will require little in the way of upkeep. The sloped roof makes sure to keep water and debris from gathering and these roofs can be made out of the toughest materials. A patio with this design will add a tremendous amount of value to your home without breaking the bank!